This Siemens Hydronic Flow Optimization video makes a strong case for using Siemens’ PICV in conjunction with their BT300 VFD series for maximum occupant comfort and energy savings by assuring accurate flow changes are made when needed. Siemens’ Hydronic Flow Optimization: How to Maximize Hydronic System Efficiency: About 41% of our worldwide energy is consumed in buildings, and 41% of that is used by HVAC and hydronic systems. 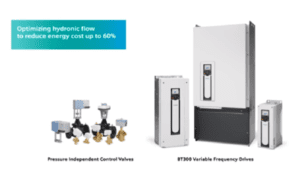 Learn how commercial buildings use hydronic systems and how Siemens’ innovative variable frequency drives and pressure independent control valves reduce hydronic systems’ power and energy needs to dynamically control flow and optimize these systems in new or existing buildings.